If you could see a piece of DNA, it would look like a ladder that’s been twisted into a corkscrew shape . . . that’s the double helix. The rungs of the ladder are made up of pairs of chemicals — known by the first letters of their chemical names — A, C, G and T. The arrangement of these chemicals determines basic features about you, whether you’re male or female, your predisposition for disease, in fact, all the characteristics with which you’re born. James Watson and Francis Crick — at the Cavendish Laboratory in Cambridge, England — discovered the structure of DNA in 1953 — after working on the problem for over a year. They built on results of other researchers such as Rosalind Franklin, Maurice Wilkins, Erwin Chargaff and Linus Pauling. One key piece of evidence involved looking at how x-rays were deflected as they traveled through DNA samples. Watson and Crick made huge models with plates and rods to test competing structures. The double helix model turned out to be correct. Tonight, a black tie dinner will be held in New York to commemorate a key insight on DNA structure — that was made on today’s date 50 years ago. James Watson and Francis Crick. “A structure for Deoxyribose Nucleic Acid.” NATURE. 25 April 1953. James Watson, The Double Helix. 1968. If you imagine DNA as a twisted ladder, the rungs would be made of so-called “nitrogenous base pairs” — pairs of chemicals called adenine, cytosine, guanine and thymine. In shorthand, they’re called A, C, G and T. The four are also known as nucleotides. The order and arrangement of these four chemicals determine what genetic information is stored in DNA. In 1951, Linus Pauling produced evidence showing that some protein molecules existed in a helix shape — the shape of a spiral staircase. He suspected that DNA had the same structure, but that still did not explain the key fact about DNA: that it could replicate. Also, Pauling’s model had three strands instead of two. The big break for Watson and Crick came when a colleague showed them unpublished x-ray diffraction images of crystalized DNA taken by Rosalind Franklin. X-ray diffraction images show how x-rays are deflected as they travel through a sample. The images suggested that DNA’s basic shape was helical. Closer analysis also allowed them to estimate how tightly the helix is twisted and determine whether there were two or three strands in a piece of DNA. James Watson and Francis Crick were aware of the work of Erwin Chargaff, who showed that within the nucleic acid molecule there was a definite relationship between the nitrogenous bases: adenine, guanine, thymine and cytosine. They seemed to go in pairs: adenine (A) went with thymine (T), and guanine (G) went with cytosine (C). At the end of their 1953 paper in Nature, James Watson and Francis Crick wrote that their new understanding of DNA’s structure might also solve another long standing mystery — how DNA makes copies of itself. It also explained why Chargaff had found A paired with T and C paired with G. According to the 1953 Nature article, “It has not escaped our notice that the specific pairing we have postulated immediately suggests a possible copying mechanism for the genetic material.” Their hunch turned out to be correct. What they were proposing was this: in order to make copies of itself, the two sides of DNA unwind. Like a ladder split down the middle, this leaves two long strands, each with a series of half rungs sticking to the side. These half rungs are single bases (A, C, G, or T). So for example, at one point, the left side of the ladder might have an A — and because A’s always bind to T’s — the right half of the ladder has a T at that point. The lovely thing about this is that each individual strand of DNA serves as a template for its complimentary strand. So, when DNA is copied or replicated, first the strands unwind, then they split and then a complicated chemical process begins in the body which constructs a second, complimentary strand for both individual strands. This forms two new DNA molecules identical to the original. 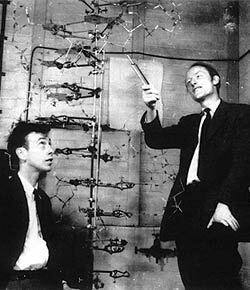 James Watson and Francis Crick won The Nobel Prize in Physiology or Medicine along with Maurice Wilkins in 1962. Tonight (February 28, 2003), there will be a black-tie dinner at New York’s Waldorf Astoria hotel to commemorate the 50th anniversary of the double helix discovery. The event will be hosted by Charlie Rose, host of a popular television talk show. 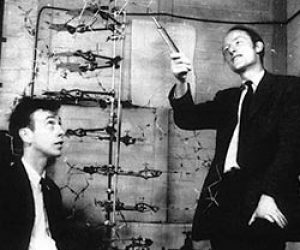 According to a Cold Spring Harbor Laboratory Web site, “the event is scheduled for Friday evening, February 28, 2003 – 50 years to the day of the actual discovery by Watson and Crick.” The gala is part of an international scientific meeting called “The Biology of DNA,” hosted by Cold Spring Harbor Laboratory.